Bhusandeswar Temple is a place at Balasore district of Odisha; which is famous for its largest Shiva Linga. The temple is very small; however the Shiva Linga is made up of large black granite 12ft height and 14ft width.Bhusandeswar Shiva Linga is Asia’s largest one. 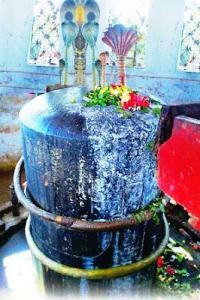 Due to its height, a platform was made encircled the Shiva Linga. Bhusandeswar temple as per mythological legend Largest Shiv Linga at Bhusandeswar, Odisha As per Hindu mythology, at the time of Tretaya age, the demon king of Lanka, Ravana was blessed by Lord Shiva and gifted by a Shiva Linga which was being worshiped by Goddess Parvati. Ravana was on his way with the Linga on his Pushpak Viman; the angels or Gods were disappointed and thought to seize the power of Ravana, which he brought from Lord Shiva. At the meantime, Ravana felt desperate or frantic and plant the Linga on this place. He tried to lift again but failed due to heaviness. For the long time, the Shiva Linga was being under the observance of wild animals. One day, a businessman from Marwadi tradition at Jaleswar (nearby Balasore) dreamt about the Shiva Linga and its legend. He came along with many other people and searched the place and made a temple there.